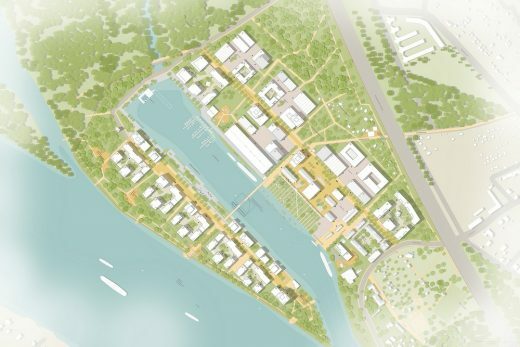 KCAP Architects&Planners, in collaboration with Vienna offices Baumschlager Hutter Partners and YEWO LANDSCAPES, has won the international urban design competition for the future development of the former shipyard area ‘Werftareal Korneuburg’, north-west of Vienna. The winning team was awarded with the first prize above three other interdisciplinary competitors. Various public information events have accompanied the competition phase. The next step will be the elaboration of the winning scheme to form the basis for the zoning plan. 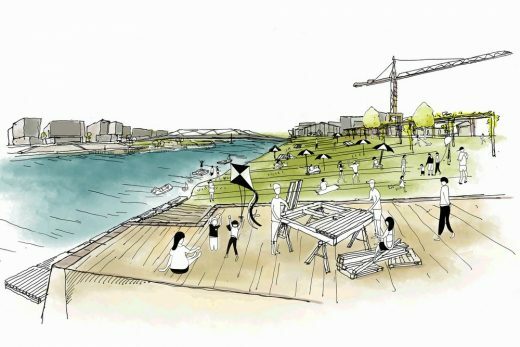 The 18 ha former shipyard area will be transformed into a vivid quarter for living, working, culture and leisure. The leading theme of the urban concept of team KCAP is the sensible transformation of the area as well as the integration of the existing structures and atmospheres into the new quarter. 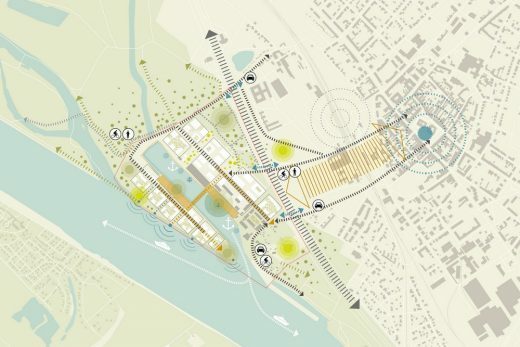 Its location along the Danube river, the large harbour basin and the surrounding meadow landscape are the urban backbone of the area’s quality and identity. 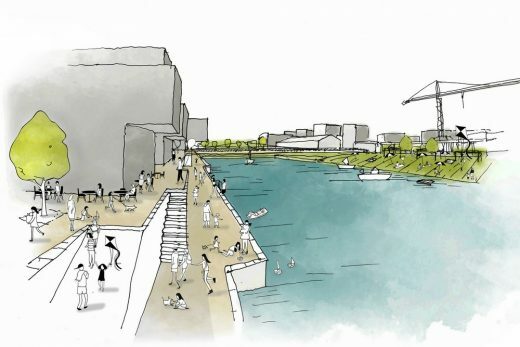 Similarly, the existing recreational, leisure and cultural facilities and the industrial buildings and structures which have witnessed the history of the site are an integral part of the proposal. The urban concept for the new quarter provides for a mix of urban living and working areas which are clustered in densified islands and surrounded by nature and water. The harbour basin in its center forms the new generous urban heart of the ‘Neue Werftquartier’. The islands offer a rich mix of typologies and programs, embedded in the green surroundings. They form different character zones of built and natural open spaces and allow clusters of housing, education, innovation, creative and cultural facilities to co-exist. 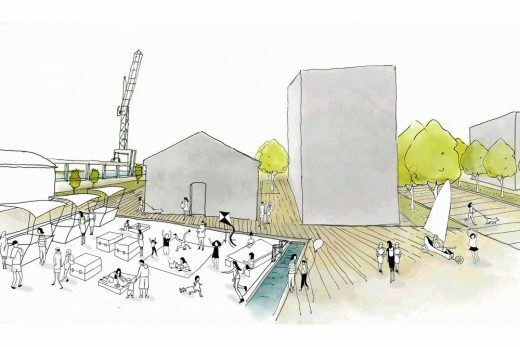 In this way, they guarantee the evolving of a colourful, urban, mixed-use city quarter with a diverse range of housing and working environments for people of different ages and lifestyles. 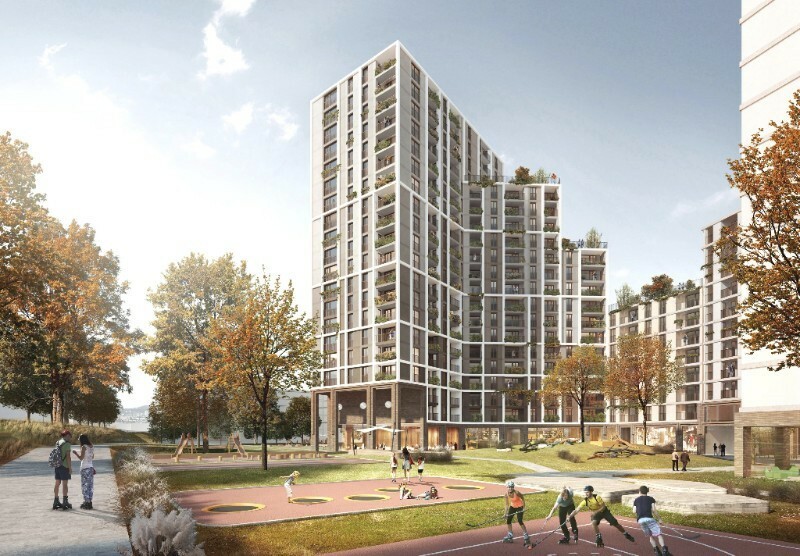 By reinforcing the existing infrastructures and creating new strategic connections, the new quarter becomes an attractive and well accessible area that benefits from the connection with the city center of Korneuburg. At the same time, it reveals the potential to develop an independent city district. 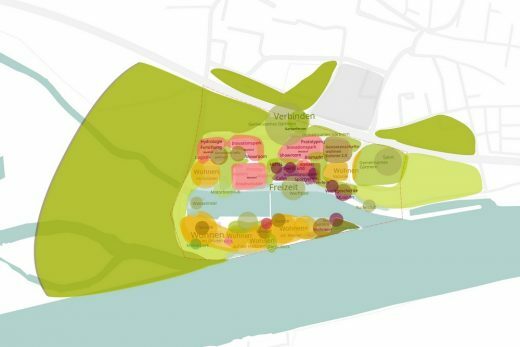 New programming and urban interventions in existing open spaces and buildings, both immediately realisable and planned on the long-term, enable the direct activation of the area as part of an open and transparent participatory planning process that will involve the citizens of Korneuburg.